An economical, automatic, vertical cabinet pants pressing system that steam-air finishes the top of the pant and center creases both legs in a single pressing operation. Standard features include automatic inseam adjustment, automatic waist size adjustment and automatic cuff size adjustment. Pressing cycles are controlled by PLC. 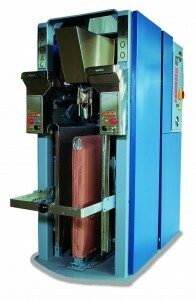 Provides a single operator the capability of pressing up to 150 pants per hour with two machines. Finishes pants with or without a crease at the touch of a button. The Pant-a-Matic 1400 automatically adjusts to waist sizes from 26 inches to 60 inches and inseams of 24 inches to 37 inches. Two Pant-a-Matic 1400’s and a reasonable work area only require around 50 square feet. Easy to operate so training is quick. Quieter and more ergonomic than ever. Programmable Logic Controller controls pressing cycles. Over 30 years of improvements.